Browning's new A5, a horrible misnaming of product, has approximately zero percent to do with the Browning Automatic-Five. The Colt 1911 pistol has far more to do with the classic A-5 than the 'new' A5, for at least it had the same designer and has a relatively large spring beneath the barrel that returns the gun to battery. In any case, it is the Browning brand's first attempt at a non-gas autoloader since the unsuccessful A-500, later renamed the A-500R, thankfully discontinued. 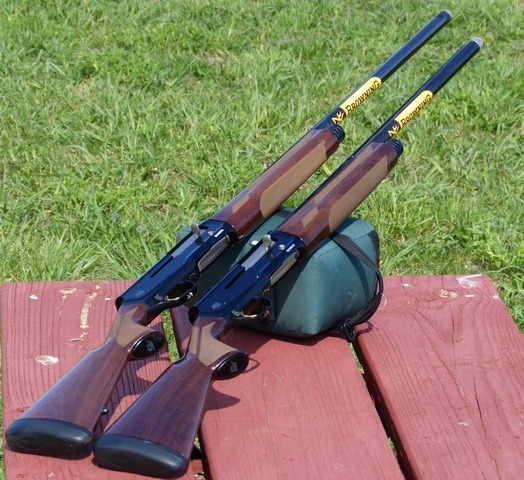 Nevertheless, the A5 is Browning's version of the Bruno Civolani action, now often referred to as the Benelli action. Fundamentally, the action is very well-done but the rest of the gun attached to it has its quirks. Both A5s I've tested thus far have had miserably heavy triggers, worthless center beads that obscure the front sight, and choke tubes that offer a brave new world of not performing as marked . . . and not being usable for most hunting applications. Bob at Precision Sports in Oshkosh took care of the trigger heavier than the gun problem. Trulock Precision Invector DS extended choke tubes do perform as marked, so that issue is resolved as well. The first run of walnut A5 Hunters had a worthless single stud screwed into the buttstock as you can see in the image above on the left gun: the 28 inch A5 Hunter. Browning thankfully no longer does that. It sounds like we are making progress and we are. 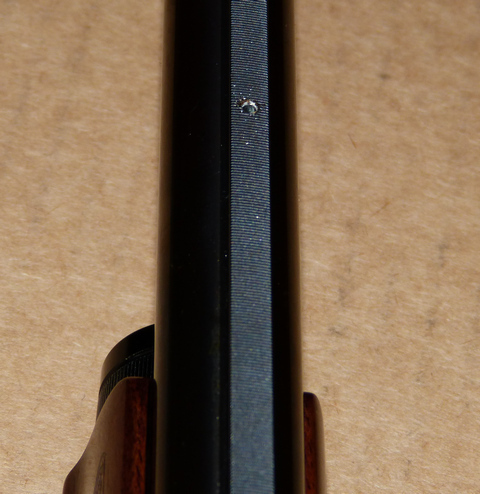 As for the center bead, at first the good folks at Browning were unable to offer any suggestions as to how remove it. More recently, Browning has noted that it is pressed in. To remove it, Browning suggests the use of a #46 drill bit and a hand drill. The oversized center bead, which completely obscures the red front bead with a 28 inch barrel, mostly obscures it with the 26 inch barrel. It is pressed into sloppy hole, that has an unsightly raised ring around it. The image above shows the empty, shoddy, untapped hole with the center bead removed. Instead, I used the Wakeman method, which historically has not always been the best option. Go down to your local Menards, and drop one dollar and ninety-nine cents on a Toolshop #243-9532 Micro Flush Cutter." You can easily get a grip on the offending bead and quickly pluck it right out. As a bonus, you'll have an eerie but momentary feeling that you have become a dentist, a sensation that quickly subsides. You are left with a very poorly machined hole in your rib, courtesy of Browning, but at least now you have access to the long sighting plane Browning speaks of and can at least properly pattern your gun and use. If this sounds like a bit much to go through with a new $1250 shotgun, it is only because it is. As mentioned before, the A5 "Kinematic Action" is well done, and this is Browning's lightest five-shot 12 gauge autoloader. Senseless drilling of holes where they are only not needed, but hurt the aesthetics and functionality of the gun, the excessively heavy trigger, the massively mislabeled choke tubes, etc., make this a hard gun to instantly fall in love with. Still, it carries and shoulders well, and if you don't mind some aftermarket trigger work and choke tubes, it is a fundamentally sound gun once you get past the very poor assembly decisions. If there is a bright spot, it is that the annoyances are easily rectified by Herstal Group with minor effort. Screwing a sling stud in the first batch of A5 Hunters (with no way to actually attach a sling as supplied) was an easy fix, as in "just don't do that." The obnoxious, poorly done, oversized center bead can be addressed the same way: just don't do that. The heavy trigger is just a matter of snapping to it, for the 725 Citori shows that Browning can apply a good trigger if they want to. If a trigger doesn't break at a reasonable 4-1/2 lbs. or so, well . . . just don't install it. Certainly Browning brand is far from alone with nasty factory triggers and they aren't nearly the worst. But, when Mossberg 930s, Franchi Affinity models, and Weatherby SA-08 examples all come with far superior triggers at a far lower price tag, the only plausible answer is that Browning doesn't care. On a $1559 retail, $1250 - $1300 street price upscale autoloader, I have to say they really should care. Just a bit more attention to detail would make this a far more appealing gun in the "out of the box" sense. You'll desperately need some quality DS replacement choke tubes for your A5. Trulock has had them available for some time, but they aren't listed on the Trulock website just yet, so you'll have to call. See: http://www.trulockchokes.com/ or dial 1-800-293-9402. To get in touch with Bob at Precision Sports to improve your nasty factory trigger: http://www.ps-o.us/ . 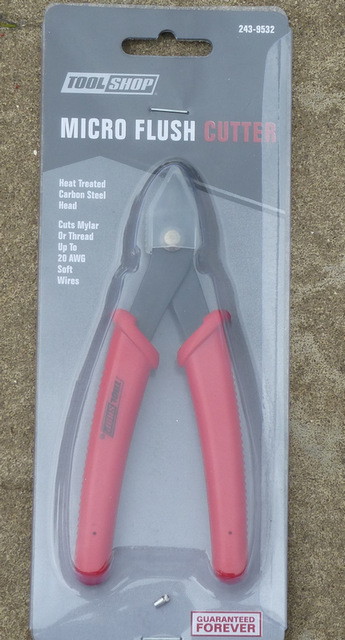 For the "TOOLSHOP MICRO FLUSH CUTTER" as shown above, Menards has them for $1.99. The successfully extracted worthless factory center bead is also shown, just to the left of the "Guaranteed FOREVER" label.